The Shakespearean canon of work is filled with such vivid character, rich language, and captivating stories that have persuaded audiences to continue to attend performances of what seems like the same plays. One of the most common of the 38 is the whimsical tale of love and magic, A Midsummer Night’s Dream. In Masterworks Theater Company’s production, the lovers and fairies are thrust into a stylistically exuberant world of mishaps and confusion at the 47th Street Theater. Directed by Tamilla Woodard, this production of the Bard’s classic features a diverse cast of actors to tell the tale of Helena and Hermia and Lysander and Demetrius as they embark on a night they’ll never forget, or remember. For a piece that has been done to death, finding innovative ways to present it to new or old audiences can be a tremendous task. What Woodard and Masterworks has going for them is they have assembled a brilliant team of actors to tell this 90-minute version of the comedy. Where it falls flat is the concept, or lack there of. Woodard employs some fantastic individual moments but with no clear overall concept, the cohesion is greatly missing. For the most part, the costumes were the clue into the view. Costume Designer Dustin Cross’s costumes were individually brilliant. From the 40s preppy look for the lovers to the industrial inspired Mechanicals to a Puck who couldn’t be any more 21st century, stringing the looks together was quite difficult. While there could be a period thread to link these together, it all goes to naught when Hermia goes touting around the forest with a modern piece of luggage. It’s quite unfortunate about the lack of solidity as the acting was quite superb. 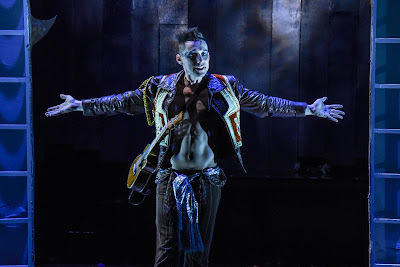 To portray fan favorite Puck, fan favorite Nick Cearley, ½ of the comedy duo The Skivies, brings his immaculate abs and ukulele-playing talent to the stage. Cearley has a wonderful whimsy about him that makes him perfect for the part. Cearley’s timing and physical humor were a wonderful bonus to the fairy. The quartet portraying the lovers was quite good. Sheria Irving as Hermia is a natural. Irving brings a sharpness to the short one that was rather unique. Irving gave a refreshing spin on Hermia. Opposite her as Lysander, Reynaldo Piniella kept up quite well. Piniella was dashing and had wonderful chemistry with Irving. Becca Ballenger as Helena brought the funny as the princess of the never-ending pining. Her bits with Irving’s Hemia were some of the comedic highpoints. When you think about this piece, you instantly recall the lovers and their story. But Woodard highlighted the Mechanicals quite wonderfully, making them purposeful and not just a device. Warren Jackson as Nick Bottom was sensational. Jackson championed Bottom’s inner thespian, discovering the nuances of the role. The rest of the troupe was equally as good, including the outrageously animated Jack Herholdt as Snout. Rather than standing in place, Herholdt gave the wall life. While Woodard wasn’t granted too much play with the set by Raul Abrego, what she did have she used well. Abrego’s set featured four ladders that eventually spun around to serve as intentionally askew trees. They were thin but simple. Lighting designer Joyce Liao used these tree pillars to her advantage, throwing some stunning colors onto the stage. A Midsummer Night’s Dream is a play that will forever be produced. When you have a great group of actors to tell the story, it proves why audiences love it. But good acting doesn’t make a Shakespeare production stand out. It needs a good vision.